In case you missed it, Clay Aiken Blogged on Tuesday! It was obvious in reading his message to the fan club that Clay was excited and looking forward to the new chapter in his career. His enthusiasm was palpable and felt all over the Internet. I happened to be home and on my computer when Clay blogged. It was fun watching the frenzy of messages that appeared and the energy and excitement that grew as the day went by. So………have you decided to take the day off?? Have you asked your daughter to do the grocery shopping? Have you updated your Ticketmaster account?? Is your credit card next to the computer? If so, you are ready. We can only hope that SOON is really SOON! Whether it is news of the album, news of a tour, or news of the PBS special, Clay Aiken made us all eager to hear more. I thought it might be fun to see a picture from each of Clay’s tours………hopefully, we can add some others soon. This great video for LovesClaysVoice fits in with our theme today. ENJOY!! I loved that feeling of excitement Clay's blogging brings to all the message boards. Thanks for the pictorial reminder of all the past tours. I can't wait for what is next. I have one thing to say if it's news about a tour – Don't forget Texas! 🙂 I want to see him in concert again. As usual I'm late to the party. Had to go out last night and this morning I get the news that he "He Blogged" I'm so excited for Clay and the ClayNation as we sit anticipating the next round of news. I'm about to jump out of my skin I'm so excited. Yes, the boards were a buzz all day yesterday. CC ready for where and when. LOL And I just paid them off. Clay's enthusiasm about the new CD was contagious. Loved seeing the his own excitement in his blog. 😀 I pulled some smile muscles yesterday!!!! Cannot WAIT for what Clay Aiken has in store for us!!! Clay Aiken can certainly wake up his fans! Much excitement on the blogs & his ofc. C'mon Clay!!! We are all waiting for the news!!!!!! Thanks for including my montage!! "HE BLOGGED!" When I saw that I thought Clay Aiken is back and ready to entertain us! 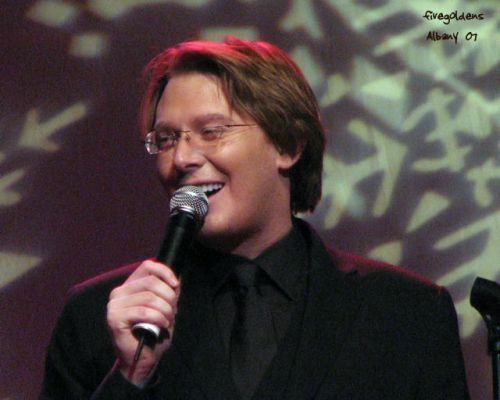 Clay Aiken sure knows how to wake the fans up…… The blog was great…and you could see how excited he was. I love how he said that he LOVES his CD… This is gonna be fun…Hang on everyone!!!!! With one blog, Clay Aiken has his fans truly excited and on alert for more. Thank you for the tour video recaps. WOOHOO — on to new music, a tour, and TV appearances in 2010! Clay Aiken news countdown will be exciting. I am so excited. I really am having trouble concentrating on anything else. Thanks for the tour memories. Looking forward to a new tour and hence new pictures!!! Oh my, I'm so excited. Waiting for whatever is to come next. That PBS Concert sounds pretty exciting. I guess he'll need an audience. Also looking forward to him touring again…and oh, yes, I wonder if he had a Photoshoot yet…..OMG…..I can't wait!!!!!!!!! It is so wonderful to see all the excitement on the boards. I am eagerly awaiting for Clay to post more information. It will be great whatever it is I am sure. The excitement and anticipation is beginning. I can't wait for more news. You could feel Clay's excitement in his blog. I know I'm checking the Clay Aiken sites a lot more often than usual waiitng to hear the news. I sure hope we hear something big this week. Updating ticketmaster was on my todo list anyway because I have a new pc. Clay's blog just moved it to the top of my list. Love the photo sequence you posted. And yes, I caught his excitment and I'm not so patiently waiting for the next round of news. All of the above. Thanks for the tour memories. I loved seeing Clay in all different ways. I cannot wait for the Decca era! Error: Error validating access token: Session has expired on Tuesday, 21-Aug-18 16:13:01 PDT. The current time is Thursday, 18-Apr-19 21:52:05 PDT.